The sheep pens and outside corral panels are down now. The tree branches that hung over the barn have been cut down, cut up and disposed of. They made me nervous that in a hard wind they would break causing damage the roof. The composted sheep manure, hay, straw and bits of feed that makes up the sheep pen by season’s end will be removed to a new raised bed near the picket fence and bean arbors. It will heat up beautifully over the next few days and when the hotness and ammonia subside over the winter, it will be ready to transfer plants started in the house over the holidays. They will be safe and warm with a layer of plastic over to protect them from frosty nights. This means I am back to pitching manure, a job usually reserved for August or September after the lambs are sold and the manure has aged in the barn for a few months. As a younger woman, I reveled when front end loaders and Bobcat tractors did the job for me, relieving me from hours of manual labor. But nowadays there seems to be a solitary kind of meditation that goes on when I pitch manure by hand. It kind of inspires me. I don’t know why. The repetition of the task seems to empty my mind of all my worldly cares. I’m centered on the task at hand and less likely to flitter aimlessly from one thought to another. The concentration sends my mind to some far away peaceful place. The place I go when I do yoga, deep thought. Or, maybe it’s just the fumes from the ammonia that sends me on some kind of chemical high that causes my mind swirl with impassioned thoughts. Slow melodic tunes will set me off the same way. 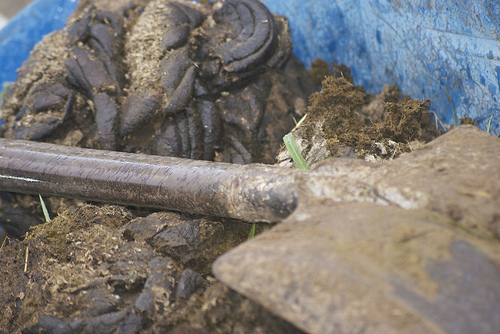 At any rate, I enjoy forking manure. It keeps me in good physical shape and reminds me of the benefits of leverage. You can’t just stab a pitchfork deep into a pile of damp packed down manure and lift up a forkful without risking a slipped disc or a hernia. The sheep have tramped down the manure and straw and shavings into a semi-solid mass. It’s easier to peel it back in thin layers. I start along one end of the raised part where the gate panel use to sit. It’s higher and lifts away easily. I slide my fork under a layer just a few inches, pushing with my foot to drive the fork into the mass, I lean down on the long handle of the fork; the curve of the tines act as a fulcrum to loosen it from the pack. Using my knees and my hands rather than just muscling it out of the pack I pitch a fork full into the garden cart for transport to the new bed. Some of my fondest memories are of long talks while pitching manure. My simple life was conceived; my plans for a farm, to grow my own food and raise my own animals were made; and my decision to do it on my own was laid all while pitching manure. It’s funny how nature can speak to you and guide you to what is right for you if you let it.